Begun as a series of posts on social media, this project pairs self portraits and written reflections for the purpose of capturing daily life with chronic illness. 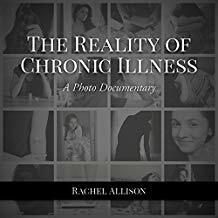 In thirty-five intimate entries, author Rachel Allison reveals her personal struggles with Adrenal Fatigue (Chronic Fatigue Syndrome) and Dysautonomia, and reflects on how they impact her everyday life as a young adult. Ultimately, Allison’s project attempts to promote communication about chronic illness. Her work will give readers understanding and insight on how to better care for loved ones who are impacted by it.